Guide to the Memories of the Lunar Sea in Fate Grand Order (NA). Check out here the stats, attributes, and skills of the Memories of the Lunar Sea in Fate Grand Order. This Mystic Code functions wonderfully on a hybrid Quick-and-Arts team. Spiritron Boost powers up both Arts Cards and Noble Phantasms; Vlad III, Robin Hood, and Medea all have powerful Arts-type NPs. Meanwhile, Stepping Stone to Ultimate Victory can be used for C. Star generation. This dual function allows this Mystic Code to work well with the hybrid team. Finally, Punishment is extremely situational, but it prevents enemies from buffing themselves. This is especially useful for saving you from the trouble of fighting a Cu Chulainn with Evade, or a Marie Antoinette with Invincibility. Increases an Ally’s Arts cards effectiveness for 1 turn. Spiriton Boost works well with servants who have a lot of Arts Cards such as EMIYA, Caster Class Servants, and Saint Martha. 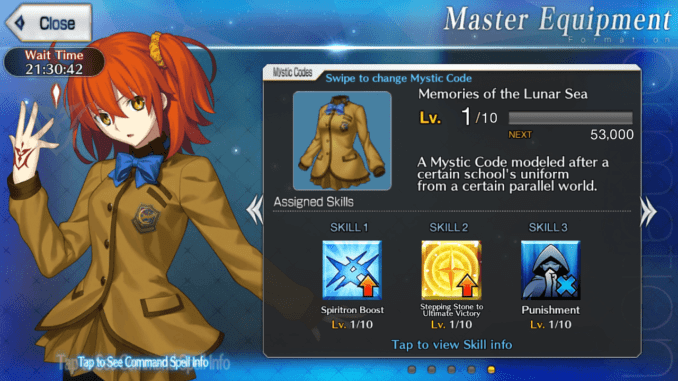 If utilized on a servant that also has a craft essence that focuses on boosting the power of the Arts Cards such as Formal Craft, players can stack the effects to easily fill up a servant’s NP Gauge. The highest possible would be the three stacks which comes from EMIYA when he uses Magecraft, Formalcrft and Spiriton Boost at the same time. Increases an ally’s critical star drop rate. Stepping Stone to Ultimate Victory is a key spell in the Memories of the Lunar Sea Mystic Code for those who are running a Crit/Quick Team. As it increases the amount of C. Stars dropped, some servants such as Okita Souji and Jack the Ripper can benefit from this. Julius Caesar who also is one of the few Sabers that utilize Quick cards for heavier damage can also benefit from the C. Star drop. Combined with a craft essence that focuses on C. Star Drop, players can gain as much as 50+ critical stars on a regular basis. Hence, the team would have an over-all increase in critical damage. Apply Nullify Buff to a single enemy for 1 time. Another spell in the Memories of the Lunar Sea Mystic Code, Punishment is an ideal spell against bosses or enemies who love casting invincibility or buffs on themselves to deal greater damage. This can prevent the enemy from shielding itself or increasing its over-all damage output, allowing your team to survive. However, it only prevents the buff once and if the enemy casts again, it will not nullify it a second time.